Below the surface | Jamie Siemsen was challenged by new perspectives as she developed the research she presented in Washington, D.C.
Jamie Siemsen was challenged by new perspectives as she developed the research she presented in Washington, D.C.
At an early age, Jamie Siemsen '17 knew she wanted to attend St. Scholastica. "I attended a Scholastic reading event at CSS as a kindergartner and somehow got the idea that I'd been accepted into the college," Siemsen said. "It took a little more work than that." Siemsen would stay connected with CSS in high school through Upward Bound — a preparatory program created to support first-generation, low-income students in their pursuit of a college education. And though she was accepted into a variety of Minnesota schools, she followed her first love and ended up on campus in Duluth. As she settled in at St. Scholastica, Siemsen found she truly enjoyed the process of fact-finding and creating deep, rich arguments. It's in this spirit that she double-majored in English and philosophy, and — with the help of key professors — began to build her skills. As part of the TRIO McNair Scholars program, Siemsen was assigned Professor Stephanie Johnson, Ph.D., as a mentor to help steer and refine her research. "My faculty mentor was able to help me figure out what I'd most like to study and research," Siemsen said. "I ended up choosing to research Lockean identity and the role of parodied recitations in the book "Alice's Adventure's in Wonderland."" Siemsen said Dr. Johnson's expertise in Victorian literature was particularly useful as she compiled research and crafted her presentation. "She was the perfect contact on campus for me," Siemsen said. "She was able to provide some context on the era I was studying, and really help me see some interesting ways to approach my research." All of the hard work began to pay off as Siemsen was invited to present research at an array of venues, from the Robert E. McNair 25th Annual Research Conference in Milwaukee to the National Conferences on Undergraduate Research event in Memphis, Tenn., and Posters on the Hill in Washington, D.C.
"At all the events, it was wonderful to attend presentations and sessions with students who've put in so much hard work, just like me," Siemsen said. "The McNair Conference was incredible, too, because all the students there have had similar challenges to what I've faced, and they're doing some pretty incredible things at young ages." 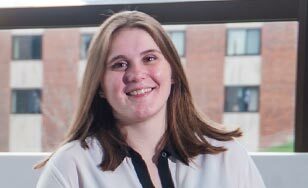 And then, just hours after her return to Duluth from Washington, D.C., Siemsen also won the prestigious Bede Library Research Award for a paper she wrote in an upper-division philosophy class. "Getting the award was amazing — it was a complete shock," Siemsen said. "You have so many questions in your mind as you're working, so it's wonderful to get some validation for the hard work you put in." Siemsen said graduate school is likely in the future, but she's put it off for a short time to work at an English language center at United International College in Zhuhai, China,. She'll leave August 30, and spend 10 months overseas. "Eastern culture is so interesting to me," Siemsen said. "I'll be helping people learn to write in English, and I think I'll enjoy experiencing a new place." As she looks to the future, Siemsen is grateful to have attended a liberal arts college that gave her tools she can transfer to any profession — critical thinking, research, creativity and heightened awareness of what's possible. "I feel like there's a tendency to move away from liberal arts education because it doesn't feel like there's a defined path, but that's the beauty of it," Siemsen said. "With liberal arts, you're able to explore your passion, and make your passion a part of your career."